Located in the northern part of Shanxi Province near the Inner Mongolian border, the coal city of Datong is probably not the first place you think of for tourism. But its gritty industrial veneer masks an illustrious past during which time it was the capital of the Northern Wei Dynasty (386-534) from 398 to 494. Nowadays it's a third-tier city mainly known for its coal mines, but remnants of its glory days can still be seen in the nearby Yungang Grottoes, the Hanging Temple further out, and several dignified wooden temples as well as a huge rebuilt city wall that surrounds its center. Besides being the Northern Wei capital, Datong was also a regional capital during the Liao (916-1125) and Jin (1115-1234) dynasties, both formed by nomadic people from the North. This means some sites like the city temples have different characteristics from most ancient Chinese temples such as entrances facing east rather than south and wooden architecture. The city itself is not spectacular but it is trying, as can be seen in its downtown area which is surrounded by a towering city wall that stands over 25 feet tall. All new, the wall is a replica of Datong's old Ming Dynasty (1368-1644) city wall that was destroyed during the 19th and 20th centuries. Featuring multi-level gatetowers and watchtowers, it is part of extensive construction a few years ago that resulted in a new-look city center intended to recreate Datong's historic past, though the enormous cost involved and the relocation of residents generated some controversy. As a UNESCO World Heritage Site and one of China's three most famous Buddhist grottoes, Yungang is Datong's most well-known site and the main reason to venture to the city for travel. 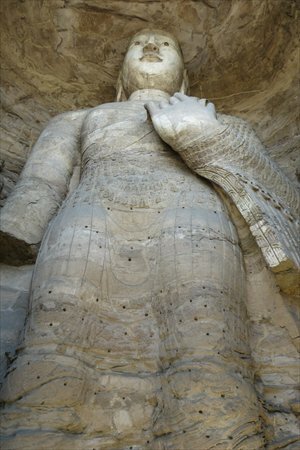 The site features dozens of caves and countless stone carvings of Buddhas cut alongside a cliff. There are gigantic Buddhas, small human-sized ones and even tiny intricate carvings smaller than your hand. The most impressive are the number 7 and 8 caves, the entrances of which are enclosed by old, multilevel wooden structures. The interior of each cave features a chamber with giant Buddhas, walls filled with stone Buddhist figures and the cave ceilings painted with colorful murals showing scenes from Buddhist legends. Basically the entire wall and ceiling are covered with statues, engravings and murals. Inside some of these major caves, photography is not allowed. I was not aware of this at first because the signs only showed a camera with a big flash with a prohibited circle which made me think only flash photography was not allowed. The site also has a small museum and several temples and shrines, including a large renovated temple alongside a small lake near the entrance. Further out from Datong are more interesting sights including the Hanging Temple and the Wooden Pagoda, both south of the city and dozens of kilometers away. I had never been to Shanxi so I was expecting the landscape to be dusty and flat, covered by the yellow loess. It was a pleasant surprise to notice on the train to Datong vast fields and plains with scenic mountains in the distance. Southward of the city, the landscape is also rather scenic with the Hengshan Mountains and loess plains with villages of old bricked houses here and there. At over 900 years old, the Sakyamuni, or Wooden, Pagoda is the oldest such building in China. Despite its age and wooden structure, it has withstood earthquakes and remains an attractive tower with its weathered but exquisite decor. It stands over 67 meters, making it one of the tallest wooden buildings in the world. However, you cannot go up the building for safety reasons. The pagoda stands in the center of a small complex so a brief visit is good enough, especially if you plan to visit the Hanging Temple which is one hour away. 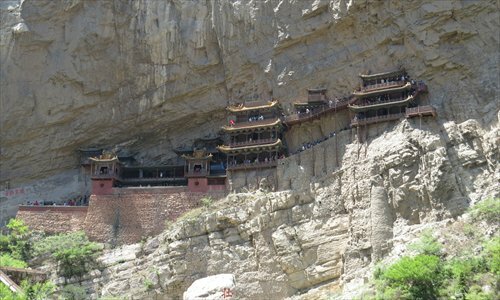 The Hanging, or Xuankong, Temple, is a temple that clings precariously to the side of a cliff. If you thought the wooden pagoda was old, consider that the Hanging Temple was built over 1,500 years ago! The Hanging Temple is one of those instances where the place is more attractive than how it appears in photos. The temple has been well maintained throughout its history and it is a wonder that even more than 1,500 years from its construction, people can still walk up and down its creaky wooden floors and steps. It is still supported by wooden beams and frames, but quite sturdy enough to handle tourists. The temple is bigger than it appears with at least four levels. Not surprisingly, space is tight on each floor with rooms on one side and narrow corridors facing the outside. The temple is unique in that it combines Buddhist, Confucian and Taoist worship, which some say makes it the only temple of its kind in China. As to why the temple was built in such a position, it provides protection from the elements. The cliff and surrounding mountains shield it from the rain, wind and sun, while being elevated protects it from floods. A look over the edges of the railings onto the ground 200 feet below swiftly reminds one of how dangerous and impressive the temple's location is. Below the temple runs a small valley with a stream and garden, with the Hengshan Mountains, one of China's five most significant Buddhist mountains, just a few kilometers to the north. Returning to the city itself, there are two famous temples that are a little more interesting than your regular Chinese temples. The smaller of the two, the Shanhua Temple, is located in a pleasant compound near the southern entrance of the city wall. It was originally built during the Tang Dynasty (618-907) in the 8th century but its earliest existing building is from the 11th century. Huayuan Monastery is an impressive collection of shrines and a pagoda in a sprawling compound. This is the largest Liao Dynasty temple in China. The main hall is an imposing structure with Buddha statues and murals, while courtyards and smaller shrines are on both sides. On the south side is a pagoda which you can go to the top and enjoy views of the city, including the temple grounds and a half-demolished hutong immediately to the south. However, most of the buildings in the monastery were recently restored or built leaving only three being originals, according to an employee. The monastery's entrance faces east rather than south as most Chinese temples, possibly because the Khitans, the people who founded the Liao Dynasty, were sun worshippers. The temples in the monastery and Shanhua Temple, as well as the wooden pagoda, were all a somber but attractive red and brown, in contrast to the more colorful Chinese temples seen in the south. The monastery lies at the top of a pedestrian street, similar to Beijing's Qianmen, and opposite the monastery's entrance are a set of newly built ancient-styled buildings. Inexplicably, the pedestrian street mainly has clothing shops with a few bars, while restaurants are to be found in a side street and along a neighboring hutong. It is hard to ignore the city walls which encircle the city center, though I did not go on top despite how impressive it looked because it is not authentic and felt very artificial. The real city wall existed in the past to protect the city when it was a strategic Ming Dynasty settlement but it was completely torn down during the 20th century. Datong also has one other well-known site in its city center - the Nine-Dragon Wall, which is, as the name implies, a wall with glazed reliefs of nine dragons that is over 600 years old. As built up as the new city wall and city center areas are, Datong's several genuine historic sights are still what make it one of the more interesting cities in Northern China to visit. By plane: There are plenty of domestic flights from Beijing, Shanghai, and Guangzhou. By train: Trains run from several major cities including Beijing, Taiyuan, and Xi'an. Some of the more interesting attractions like the Hanging Temple, Wooden Pagoda, and Hengshan Mountains are located in nearby counties several dozen kilometers outside of Datong, so you can either take the county transport bus or hire a taxi for around 300-400 yuan ($48-64) for the day.